Choose a card from your opponent's hand without looking and discard it. If you discarded a Trainer,  Supporter, or Stadium card, choose 1 more card from your opponent's hand without looking and  discard it. 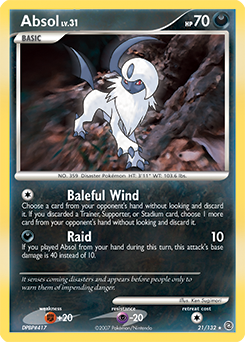 If you played Absol from your hand during this turn, this attack's base damage is 40 instead of 10.